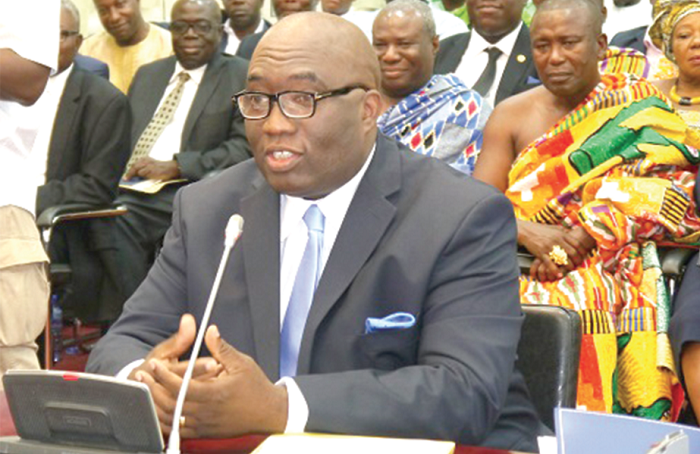 Minister for Railways Development, Joe Ghartey, and four others including Dan Botwe, Vice President Bawumia and Alan Kyeremanteng have come up in a poll of who leads the ruling NPP after current President Nana Addo Dankwa Akufo-Addo. Some 4000 NPP delegates according to the Daily Dispatch newspaper edited by Pollster Ben Ephson say they prefer the four over other names that have come up so far. Joe Ghartey, who is Member of Parliament (MP) for Essikadu Ketan, will be making another challenge for the slot after his last attempt in 2014, where he eventually stepped down for the current President. Joe Ghartey is 55 years old (2017), and a graduate of the University of Ghana, where he obtained an LLB (Hons) in 1986, before being called to the Bar in Ghana in 1988. He then joined the Law Firm of Akufo-Addo, Prempeh & Co. as a Pupil and subsequently became an Associate. In 1995, he founded his own law firm, Ghartey & Ghartey. He has taught Company Law at the Ghana School of Law, Securities Industry Law at the Ghana Stock Exchange, Investment Law at the Ghana Business School, University of Ghana and Corporate Governance at the Ghana Institute for Management and Public Administration (GIMPA). He is currently an Adjunct Senior Lecturer of International Trade and Investment Law, as well as Company Law, at the Faculty of Law, University of Cape Coast. He has authored the leading Ghanaian text book on doing business and investing, “Doing Business and Investing in Ghana: Legal and Institutional Framework”. He entered Parliament in 2005 as the Member of Parliament of the Essikado-Ketan Constituency. In June 2006, he was appointed Deputy Attorney-General and Deputy Minister of Justice. From June 2006 to January 2009, he was the Attorney-General and Minister for Justice. In 2009 and 2012 he was re-elected as Member of Parliament for the Essikado-Ketan Constituency. During the Sixth Parliament, he was the Second Deputy Speaker of Parliament. He returned to Parliament for the fourth time as the Member of Parliament of Essikado-Ketan Constituency in 2017. Whoever is chosen to lead the NPP has a date with former President John Mahama at next year’s polls. The 2020 election is largely going to be on the record of the current administration and Mahama’s previous years in office.